Fast reliable OEM compatible Transceivers. 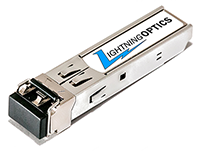 From first generation transceiver footprints like the GBIC, to the latest and greatest 100GB and beyond, LightningOptics has an optical transceiver to fit every need. The industry-standard Small Form-Factor Pluggable (SFP) Gigabit Interface Converter links your switches and routers to the network. The hot-swappable input/output device plugs into a Gigabit Ethernet port or slot. The 10GBASE-SFP+ transceivers give you a wide variety of 10 Gigabit Ethernet connectivity options for data center, enterprise wiring closet, and service provider transport applications. The 10GBASE-SFP+ is a hot-swappable input/output device that plugs into an Ethernet SFP+ port of a switch or router (no need to power down if installing or replacing). The 10GBASE-XFP transceiver offers customers a variety of 10 Gigabit Ethernet and Packet-over-SONET/SDH (POS) connectivity options for data center, enterprise wiring closet, and service provider transport applications. The 10GBASE-XFP is a hot-swappable input/output device that plugs into an Ethernet XFP port of a switch or router (no need to power down if installing or replacing). The industry-standard Gigabit Interface Converter (GBIC) is a hot-swappable input/output device that plugs into a Gigabit Ethernet port or slot, linking the port with the network. The 10GBASE-X2 transceivers give you a wide variety of 10 Gigabit Ethernet connectivity options for data center, enterprise wiring closet, and service provider transport applications. The 10GBASE-X2 is a hot-swappable input/output device that plugs into an Ethernet X2 port of a switch or router (no need to power down if installing or replacing).